The false promise of sanctuary cities. For many undocumented immigrants, the protections offered by left-leaning cities mean nothing at all. 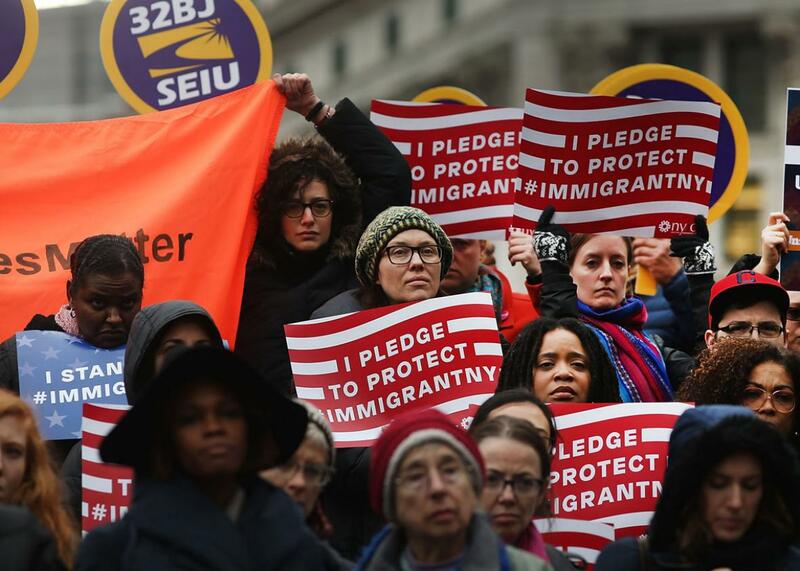 Immigration activists participate in a prayer and rally against President Donald Trump’s immigration policies on Jan. 27 in New York City. In the wake of President Trump’s nativist crackdown, mayors in left-leaning cities have defiantly proclaimed that their cities will remain “sanctuaries” where immigrants can find refuge. The definition of a sanctuary city is somewhat murky: At minimum, it is a locality that won’t hold suspects for Immigration and Customs Enforcement or allow their police officers or sheriffs’ deputies to do the work of federal immigration agents. But for many immigrants, such protections mean nothing at all. It’s not just tough-on-crime Republicans that preside over a criminal justice system that today serves as the front door for a massive deportation pipeline. Every day, police and prosecutors in Democratic Party–controlled cities fuel mass incarceration by arresting and charging people for low-level nonviolent offenses. An arrest for jumping a turnstile or a minor drug charge could result in a person’s separation from his or her family forever. America is the most incarceratory nation in the world—in 2015 alone, police made an estimated 11 million arrests. For undocumented immigrants, an arrest can trigger detention and deportation by ICE. And that’s true even if a self-described sanctuary city refuses to detain someone upon federal request. The fingerprints police collect when booking someone into custody are automatically shared with federal immigration authorities, whether that police department wants to share them or not. A fingerprint match alerts ICE that a suspected undocumented immigrant has been arrested. ICE agents can then find that person, detain them, and deport them. If ICE wants to detain someone, they can find and detain them anywhere in the United States regardless of whether local officials are cooperating. Now, under Trump, a man who has declared that the Mexican government is coordinating the mass migration of rapists to the United States and that Muslims pose an existential threat to the West, things could get far worse. On Friday morning, the Associated Press reported the existence of a draft memo that indicates the Trump administration is considering the unprecedented step of deploying 100,000 National Guard troops “to perform the functions of an immigration officer in relation to the investigation, apprehension and detention of aliens in the United States.” As of last year, ICE employed roughly 5,800 deportation officers. (The White House has denied it is considering such a policy but did not deny the existence of such a memo.) With more boots on the ground, the imperative for local criminal justice officials is clearer than ever. As long as police and prosecutors continue to arrest and charge people for low-level offenses, sanctuary cities simply aren’t safe for undocumented immigrants. Recently, the administration began an end run around self-proclaimed sanctuary cities. In Travis County, Texas—which includes Austin, the state’s liberal mecca—Sheriff Sally Hernandez promised recently to ignore most ICE detainers or requests to detain an immigrant. But according to a news report last week, immigration officials obtained federal arrest warrants for at least 42 immigrants, charging most with federal felonies for illegally re-entering the United States. By using judicial arrest warrants instead of detainers, ICE is now requiring rather than requesting that immigrants be detained—and Hernandez was thus compelled to turn them over to the feds. ICE also identifies, detains, and deports immigrants after they have been convicted of a crime, including very minor ones. Even lawful permanent residents who have spent their entire cognizant lives in the United States can be deported as the result of a minor drug-dealing conviction. For undocumented immigrants, incarceration in state prison will also tip off the feds: If you’re locked up, they’ll know exactly where to find you. Harsh and inhumane federal immigration laws are, of course, the fault of the federal government. But as long as local law enforcement shares information with ICE, everyday policing and prosecution are complicit in Trump’s crackdown. For decades, mainstream Republicans and Democrats have turned local criminal justice systems into the grease that smooths the federal deportation machine’s operation. It was legislation passed by the Republican-controlled Congress and signed into law by President Bill Clinton in 1996 that made it so easy to deport lawful permanent residents for minor crimes. And it was the Secure Communities program initiated under President George W. Bush and rolled out under President Obama that has rendered local police de facto immigration agents and made it virtually impossible for states or localities to opt out. Trump undoubtedly poses a historic threat to immigrants. But local elected officials and prosecutors cannot just shrug their shoulders and blame mass deportations on Washington politicians. Local district attorneys are responsible for the vast majority of prosecutions that result in incarceration. These local prosecutors must also take responsibility for the massive deportation campaign that Trump has pledged to undertake. Simply ignoring federal detainer requests isn’t enough to make a city a real sanctuary. Sanctuary cities were a critical victory won by activists. They were implemented because outraged immigrant communities—with assistance from federal courts that found detentions raised serious constitutional issues—successfully pressured cities to refuse to cooperate with federal detainer requests. In Washington, that pressure led Obama, who had carried out mass deportations, to more narrowly define which immigrants would be prioritized for removal, amongst other reforms. But Obama left the program’s basic information-sharing architecture in place and ready for full deployment by the most nativist administration in recent U.S. history. Purportedly progressive mayors are offering immigrants a false sense of security. The reality is that sanctuary cities are not doing enough to mitigate the immigration threat that Trump poses. The only reason that Secure Communities works is because it affixed the deportation pipeline to the largest policing and imprisonment system on Earth. Cities can and must shrink their contribution to that system by arresting and prosecuting fewer people. While localities can’t end drug prohibition, they can pull back from fighting the drug war by ceasing to arrest and prosecute people for drug possession and minor drug-dealing offenses. Prosecutors and police don’t make laws, but they have the power of discretion.